In 2015, nearly three million people were injured or fell ill at work across the United States. In Ohio, over 88,000 people were allowed a workers’ compensation claim. 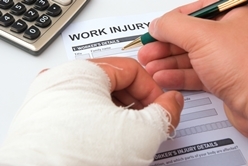 For those who experience workplace injuries, the consequences can include missed work, lost wages, diminished future earnings, medical expenses, and physical pain. The workers’ compensation system exists to ensure that employees are protected when they suffer a workplace injury or illness. The benefits can offer employees the care and time they need to recover fully without having to deal with added financial stress and burden. And because every situation is unique, the Ohio Bureau of Workers’ Compensation (BWC) attempts to address situations by offering many types of benefits. Temporary total compensation (TT) – These benefits are available to an injured employee unable to work for a specific period of time. The injury or illness sustained is recoverable, and the employee will return full ability after the recovery period. Percentage of permanent partial disability (%PP) – When some amount of permanent damage results from the work injury, the employee can receive these benefits. For example, if a worker injures his arm and heals but is can never fully extend the arm, he may have this type of compensation. It is also called compensation for residual impairment. Permanent total disability (PTD) – These benefits cover employees who suffer an injury or illness so severe that they can never recover enough to return to work. PTD can be payable for life, as it addresses the employee’s loss of earning capacity. Death benefits – Sometimes, a workplace accident or injury results in the death of the employee. When that happens, the employee’s surviving family members may qualify to receive compensation. Scheduled loss – A scheduled loss comprises amputation, loss of use, or ankylosis of a specific body part, and loss of vision or hearing. This compensation is offered besides the other benefits. Facial disfigurement – When an employee suffers a disfigurement to the face or head that can affect his ability to find and retain work, he may be eligible for this compensation. Living maintenance – For those injured workers who are participating in an approved rehabilitation program. Living maintenance wage loss – For those who have completed rehabilitation and returned to work, but experience a loss of earning compared to their wages before the injury. Disabled workers relief fund – For those receiving permanent total disability payments below the cost of living. The cost of living is determined annually by the BWC. Wage loss – For those who have returned to work in a different form than before an injury and experience a comparative loss of wages, or those who have not returned to work because they cannot find employment within work restrictions. Ohio operates one of the largest workers’ compensation systems in the country, and the different compensation available can easily become confusing. If you or someone you love has suffered a workplace illness and injury, you want to be sure you obtain the full compensation you deserve. Call the experienced workers’ compensation attorneys at the Monast Law Firm to learn more about your rights and how our dedicated legal team can help.